This important book is an authoritative work of reference on the G20, G8 and G20 reform, and relevant information sources. Peter Hajnal thoroughly traces the origins of the G20, surveys the G20 finance ministers' meetings since 1999 and the series of G20 summits since 2008. He examines agenda-setting and agenda evolution, discusses the question of G20 membership and surveys the components of the G… 20 system. He goes on to analyze the relationship of the G20 with international governmental organizations, the business sector, and civil society and looks at the current relationship between the G8 and the G20. He also discusses how G20 performance can be monitored and evaluated. The book includes an extensive bibliography on the G20, G8/G20 reform, and issues of concern to the G20. 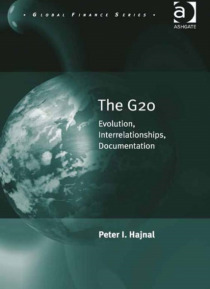 The book is a companion volume to The G8 System and the G20: Evolution, Role and Documentation (Hajnal, 2007) and is an essential source for all scholars and students of the G20.